These waterfalls have no official name. A published guidebook referred to these as the Cascades Along the Overbrook Trail, but they are technically a variety of waterfall types instead of just cascades, so I have elected to call them the Falls on the Overbrook Trail. 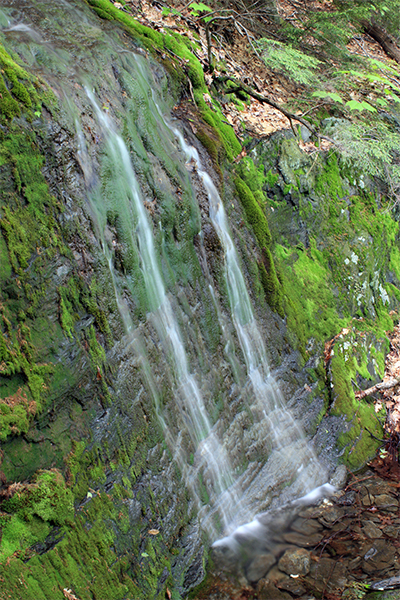 The falls are located on the grounds of one of the Mass Audubon's premier properties. The trails benefit from the same exquisitely-maintained grounds and trails that the organization in known for. There are several cascades and waterfalls found along the Overbrook Trail, and each needs a high volume of water to be attention-worthy. The premier falls is a 15-foot curtain of water over the mossiest rock wall I have ever seen in New England. The elevation is so high at this point in the trail that water flow is almost always a trickle. Try to visit in mid-to-late April for the best show. From the parking area, cross the dirt road and check in at the visitor center. After paying the day-use fee ($5 for non-members in 2017), take a right after exiting the center and follow the Bluebird Path northwest for 0.4 mile across a field, past an array of solar panels, and down into the woods. When you reach a junction with the Ovenbird Trail after 0.3 mile, bear left onto that trail and continue 300 feet to its junction with the Overbrook Trail. Take a left onto the Overbrook Trail and continue climbing at a moderate incline. After hiking the Overbrook Trail for 0.3 mile, you will reach the lowermost falls as the trail crosses the brook directly below it. 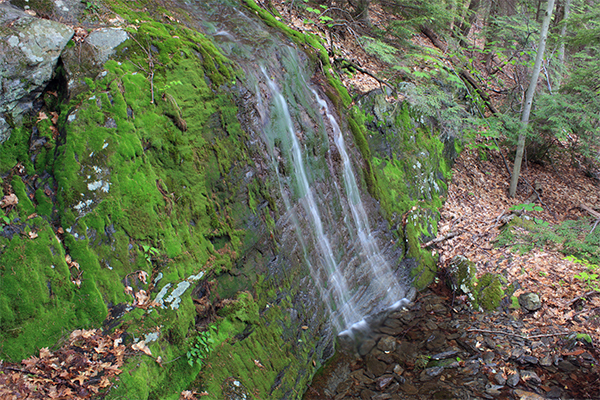 Keep climbing along the trail with the brook on your right for an additional 0.2 mile to view the middle falls and the pretty and moss-covered upper falls. The upper falls may be close to dry depending upon current water conditions. Take note that all trails that lead away from the visitor center are blazed blue and all trails that lead back are blazed yellow. This is a rather unique trail marking strategy and not one that I think I've ever seen. I suppose it could be helpful if you ever found yourself lost on the mountain without a trail map. From Pittsfield, take the combined highway US-7 south and MA 20 east. Continue traveling on US-7 south and MA 20 east for 1.8 miles past the "Entering Lenox" town line sign (which is on the opposite side of the road) and take a right onto West Dugway Rd (Note: West Dugway Rd is 0.6 mile north of the junction of US-7, MA 20, and MA 7A in Lenox). Travel on West Dugway Rd for 0.7 mile and you will reach a fork. Take the left fork onto West Mountain Rd and continue for 0.8 mile, at which point you will reach the visitor parking area for the Pleasant Valley Wildlife Sanctuary. The trails within the sanctuary are open from dawn to dusk, 365 days a year, but the visitor center has limited hours and is closed on Mondays in winter. The parking area is on West Mountain Rd and so you don't have to worry about any gates or parking areas being roped off. There are seven miles of trails within the sanctuary. The visitor center has maps and can answer any questions you have about any of its trails.